A new report on Latin America by Eurodad partner networks - including CIFCA, Grupo Sur, ALOP and APRODEV - sheds light on some of the challenges created by the current trend of using ODA to leverage public and private finance. 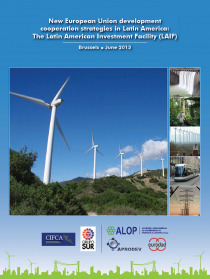 The Latin American Investment Fund (LAIF) - one of the regional facilities set up by the European Commission to channel development monies - aims to mix grants with loans from multilateral or bilateral public European development finance institutions, regional development banks and whenever is possible private loans. The LAIF is considered as one of the financial mechanisms designed to mobilise additional financing to support development, especially large infrastructure projects, but also small and medium enterprises under the ‘green economy’ model. ■Absence of criteria for monitoring and evaluation, as well as strong and transparent social and environmental safeguards and mechanisms for accountability. ■Carrying out prior and informed consultation with the people directly, indirectly and potentially affected by the project. ■Projects should undergo a prior assessment of their impacts on poverty that identifies their beneficiaries, undertakes an analysis of the stakeholders, and clearly defines objectives and the aspects of poverty they are addressing, as well as expected results.